The Website Analytics Pixel tracking is a key feature in optimizing a Native Ads campaign. The Native Ads Advertiser Pixel is a tracking code that can be inserted into a webpage’s HTML code. The system pauses under-performing ads and traffic sources if it isn’t reaching the minimum amount of pageviews that was set under the Campaign Optimization step when the campaign was initially created. Any ad or traffic source that does not meet the pageview goal will immediately be paused to give the best performing ads the opportunity to be even more successful. Data is gathered over an average of 7 days to determine which ads are not doing as well as others, pause those ads, and concentrate on the better performing ads. This tool will help ensure that the advertiser is running a profitable campaign as Native Ads is pulling traffic from profitable widgets to driving it to ads that meet the advertiser’s performance parameters. 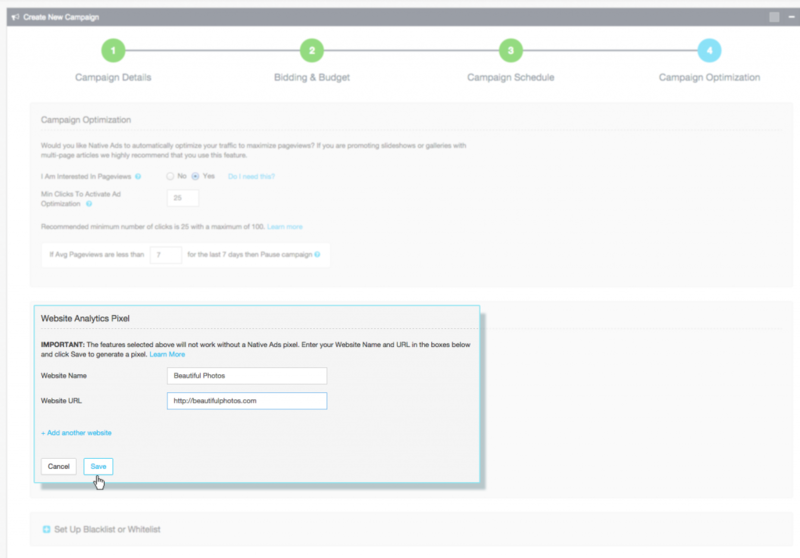 The optimization goals in the Campaign Optimization Section will not work without the Native Ads Advertiser Pixel added to the head section of the campaign website’s HTML code. The Titan platform will save this information and send the Pixel via email. Open the website’s HTML code. Paste the code in the “Head” section. Note: The Pixel will not work if placed outside this section. Learn more about CPA Optimization or learn more about Page View Optimization. Please contact Native Ads support with any questions or inquiries!